Can I make Payments with Qkr? 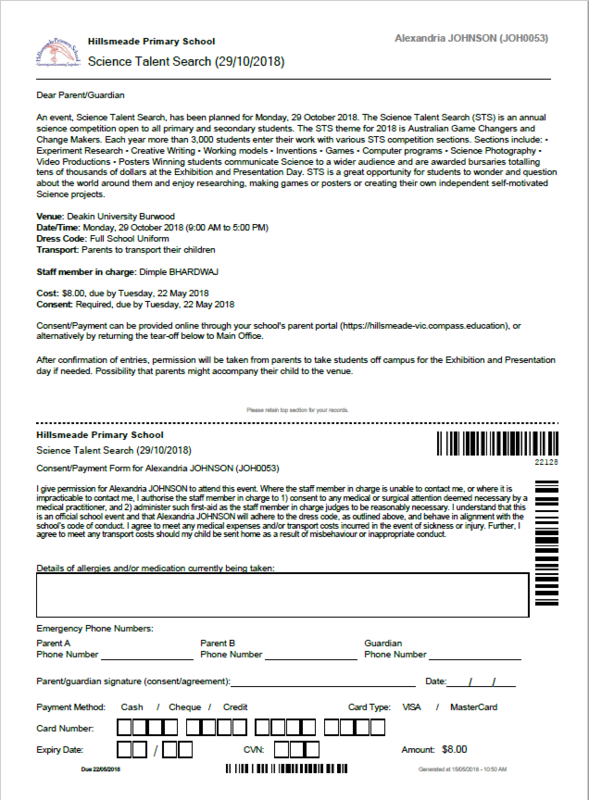 When an event is available to parents we will usually send out a targeted news item to those parents, and classroom teachers will talk to the students about it. There is no events section in the Compass App, you will need to log in to the Compass website to look at the event and provide payment/consent. We are no longer sending home paper consent forms to all students by default. For the majority of parents you will be notified about the event through Compass and will provide payment/consent through Compass, all electronically with no paper required. When you log in to the website you will see a notification about the event at the top of your news feed on the right hand side. When you click on the event notification you will see a list of events for that child (past, present and future). If you click on the name of the event you will be able to see all the details, including resources that we have included such as website, brochures, packing lists, schedules, etc. See yesterday’s Compass tip for more information. For events where you need to provide payment or consent, there are two big buttons: a red one for paying online through Compass, and a grey one for all other payment methods. Once you have completed this form you will receive an email from Compass confirming your payment. There is no need to provide any paperwork, your child will be able to attend the event. If you want to pay with another method, then click the grey button Print Form (Offline). It will provide you with a PDF you can print and send to school with your child. This form is unique to this child and this event, so you will have to print each child’s consent form for each event if you have more than one child/event. If you want to use CSEF (Camps Sports & Excursions Funding) for this event, please write a note on the consent form to indicate this request. You can contact the office to get a balance of how much CSEF you have available. Once you are finished providing payment you will see a green notice at the top of the event indicating no more actions are required. This will appear immediately if you use the online option, or after the office has processed your form if you use the paper (offline) option. You can make payments with a debit card, which behaves exactly the same as a credit card but does not have a credit facility. The major banks all provide debit cards with no monthly fees. Unfortunately this is not supported by Compass. If you wish to use CSEF then you will need to provide consent using the paper form (offline option). No, we are no longer using Qkr for school payments. (It is still being used for ELC, OSHC and the Canteen).